The International Watch Company’s mission is simple: to manufacture watch movements of the highest possible quality. This has remained their aim for the past 150 years and their current six watch families pay homage to their primary purpose. 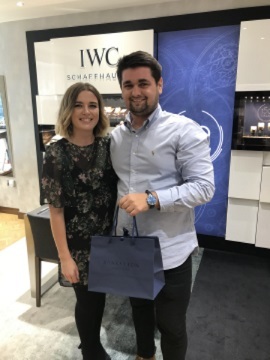 Here at Banks Lyon, we know that purchasing a watch as elegant as a piece from IWC, is not just meant to be a simple transaction; it should be an experience to treasure for a lifetime. 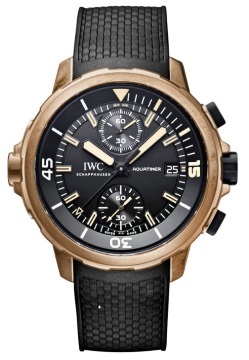 That’s why we offer an exclusive personal shopper service for IWC products in our flagship Lancaster store. To best demonstrate the special experience a customer can expect from the team at Banks Lyon, we invited a member of our digital marketing team down to the store to experience this first-hand. Below is the customer experience of Matt Hartley, a member of the SQ Digital team, told in his own words. When I arrived at the store, I was greeted by the fantastic Ruby, who explained the whole process to me. The first thing that struck me, as soon as I was taken to the private viewing room, was how relaxed and at home I was made to feel by all the staff. 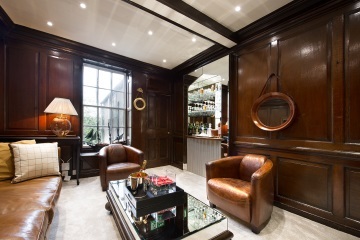 After Ruby offered me a drink or tipple of my choice in the private lounge area, she got to know me and took the time to understand what kind of lifestyle I lead, so that she could determine which watch would best suit me. 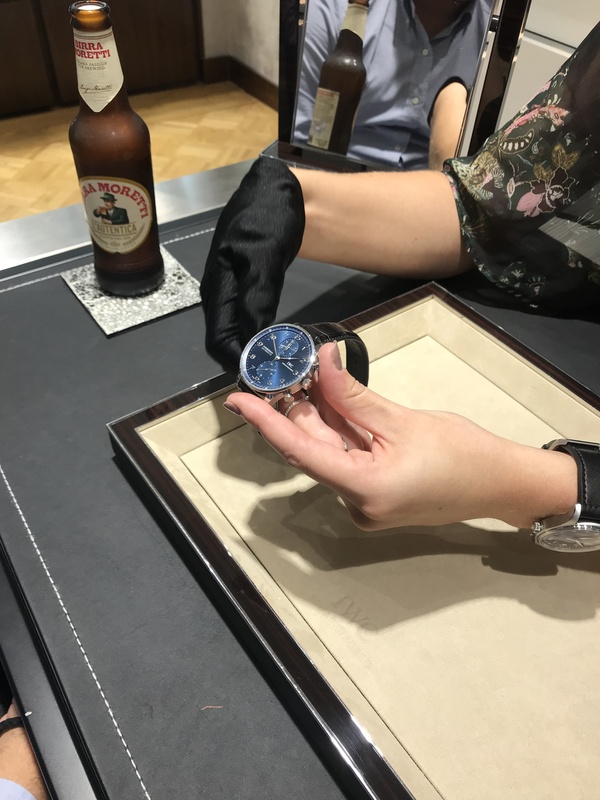 After the warm welcome and with a fresh coffee in hand, I was introduced to the IWC brand, its history and values, and given a brief introduction to the four IWC watch families Banks Lyon stock. Following all this, I was eager to take a closer look at some of the timepieces that Ruby felt would best suit me. Here’s a roundup of the five watches I was shown during my time at Banks Lyon. The first collection I had the pleasure of viewing was the Portofino, a perfect choice for the traditional gentleman. These stylish dress watches are among some of the most accessible watches in the IWC collection, starting at just £3750. Ruby identified the IWC Portofino Chronograph watch as a piece that could be ideal for my lifestyle; taking its design cues from the 1960s, this elegant stainless-steel chronograph features sporty push-buttons and is powered by the tried and tested self-winding 75320 calibre with its 44-hour power reserve. This particular piece featured a wonderfully comfortable, dark brown alligator leather strap which was extremely comfortable; I was also blown away by how light and elegant this piece felt on my wrist. The Portofino Chronograph is available at £4750, or from as little as £79.17 per month on 0% finance over four years. Next, I was shown several watches from the Aquatimer range, which is a perfect watch for the more sporty and adventurous gentleman. This family of watches boasts water-resistance up to 300m, and all come equipped with a stylish rubber strap. The model from this family that caught my eye was the Aquatimer Chronograph Edition “Expedition Charles Darwin” watch which has an added touch of class, as it pays homage to the HMS Beagle, the ship that carried Charles Darwin on his expedition to the Galapagos Islands. On the case back, you’ll find an expertly engraved, expressive portrait of Darwin which really made this watch stand out from others I viewed on the day. The watch had a completely different feel to the Portofino I had previously tried on; the sturdy and comfortable rubber strap felt comfortable on the wrist. This watch felt much heavier on my wrist due to the larger case size, but this added to the overall luxury feel of the timepiece. 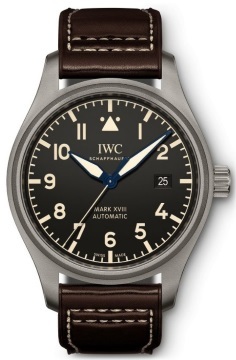 The next watch I was presented with, was the compelling IWC Pilot’s Mark XVIII Heritage watch, featuring a design that is reduced to the absolute essentials. With a display that is clear and large, the main focus of this watch is to be as simple and easily legible as possible for the wearer. The striking dial is a complete contrast in colour to the large Arabic numerals, ensuring that every part of this watch makes a bold statement. This timepiece also comes with a steel casing which protects the watch from any magnetic interference which may cause the watch to pause, making it perfect for pilots who work in an environment with plenty of magnetic forces in play. This model is available on 0% finance from Banks Lyon, starting at £364.83 per month over four years. Finally, I was shown the stunning Portugieser range. A real all-rounder, this collection boasts some of the most simple, yet stunning timepieces on the market. I was shown the Portugieser Chronograph which immediately peaked my interest, thanks to the striking blue dial. Ruby explained that this particular watch was a firm favourite with watch aficionados around the globe and has been the most sought-after model in the Portugieser family since 1998. As soon as I put this watch on my wrist I was blown away by the light-weight feel of the piece and the comfort of the black alligator leather strap. The simple, but genuinely stunning blue dial rounded off a really special feel to the watch. 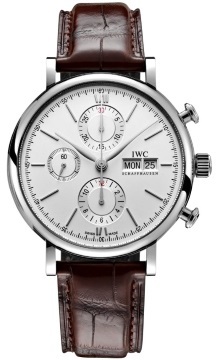 The final model I was presented with was the truly special IWC Portugieser Perpetual Calander watch. 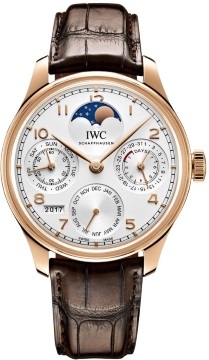 This model oozes luxury and is perfect for the sophisticated gentleman; the watch boasts a moon phase display on the Portugieser Perpetual Calendar, which diverges by just 1 day in every 577.5 years – a true feat in watchmaking. This timepiece is powered by an IWC-manufactured movement from the 52000-calibre family and features a red gold rotor and blued screws. The 18-carat red gold watch has an arched-edge front glass and comes with a dark brown alligator leather strap. The quality of this timepiece was evident as soon as I put the watch on my wrist. The watch case had a weighty feel, thanks to the 18-carat rose gold casing. On the case back, you can view the inner workings of this magnificent watch, which is truly mesmerising. After going through the whole process, Ruby was confident she had found the perfect watch for me, and she wasn’t wrong. I had totally fallen in love with the Portugieser Chronograph watch; the all-around feel of the watch, from the comfort of the strap to the enchanting blue dial, had completely sold this model to me. After a refill of my choice and some time spent deliberating on which payment plan was right for me, I was ready to make the purchase. Ruby guided me through the process every step of the way and laid out all the payment options available to me. This particular model was available to me from £109.17 per month on 0% finance over four years. Once you are ready to leave the store with your new IWC watch, this doesn’t mean your experience in Lancaster need come to an end just yet. There are plenty of things to do and see in Lancaster, which can make your day that little bit more special. If you’re looking to experience the Banks Lyon treatment and sample some of our stunning IWC watches, please feel free to arrange an appointment with our friendly and experienced team at our Lancaster showroom by calling 01524 297 014.